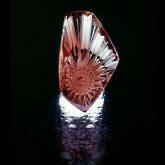 Oregon sunstone is world renowned for its stunning all-American beauty, and has won many awards over the last two decades. 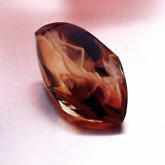 We are very proud to be members of the American Gem Trade Association, and over the years, The AGTA has recognized the beauty of Oregon sunstone by issuing many awards to the top designers and carvers in the industry. 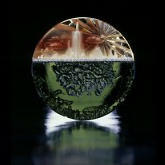 Please take a moment to view the winning entries from 2002 through 2007. 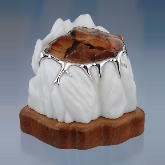 "Polar Spring" carving featuring a 202 ct. Sunstone set on silver and white marble. 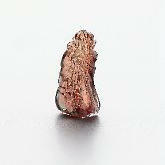 featuring a 62.0 ct. free form, combination cut bicolor Sunstone. 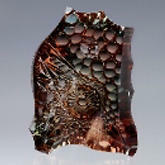 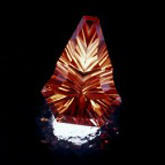 73.55 ct. Oregon sunstone with copper feathers and green highlights. 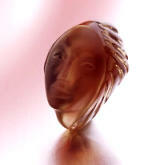 69.15ct Oregon sunstone freeform carving of a woman's face. 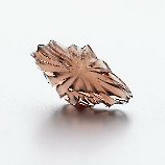 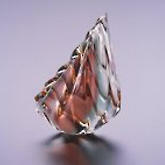 47.20 ct Oregon sunstone, freeform carving.